New Research from Michigan University re ??climate-change-foes?? climate-change advocates are largely failing to influence public opinion. has surely left academic neutrality and clambered on board the Man Man Climate Change advocacy position. The terms really do not make sense. As world leaders meet this week and next at a historic climate change summit in Paris, a new study by Michigan State University environmental scientists suggests opponents of climate change appear to be winning the war of words. The research, funded by the National Science Foundation, finds that climate-change advocates are largely failing to influence public opinion. Climate-change foes, on the other hand, are successfully changing people’s minds – Republicans and Democrats alike – with messages denying the existence of global warming. The leader of the study is a sociologist, Aaron M. McCright. As one aware that the man made climate change hypothesis has been falsified (many times), I find Mr McCright's terminology confusing. Who is an opponent of Climate Change? Climate has changed since time immemorial. To be an opponent of climate change is like being a Climate Canute trying to turn back the inevitable change of climate. Seemingly just a silly. As Climate Change is as inevitable as night following day, why advocate change? It will happen. 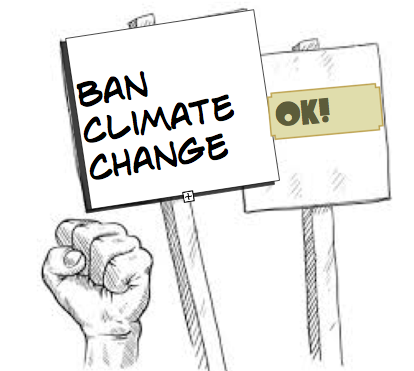 The realists know that climate changes, so they cannot be "Climate-change foes."